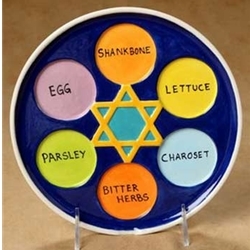 Please join us at Pea Poddery for some light refreshments as we decorate our own Seder Plates. The fee will include all materials for a finished plate. Once plates are ready, we will pick them up and bring them to the Temple building for pick-up. No experience required! If interested, please RSVP by Friday, January 18th! Contact Jamie with any questions. *We have to order the plates in advance, so late signups are not guaranteed a plate.